TAIPEI CITY -- “Samurai Japan” have swept the 2013 Baseball Challenge against Chinese Taipei, a head-to-head series officially sanctioned by the World Baseball Softball Confederation (WBSC). New manager Hiroki Kokubo led the Samurai over their Asian rivals 4-2, 4-2 and 1-0 in three close games in Taipei City, confirming Japan’s leader status in Asia. More than 25,000 people saw the three games played at Xinzhuang and Tianmu Baseball Stadiums in Taipei City, highlighted by a 9,700-crowd at Saturday’s matchup. All three games were broadcasted live at primetime in Japan and Taiwan. Japan are currently ranked 3rd in the world, trailing fellow “world powers” Cuba and the United States. 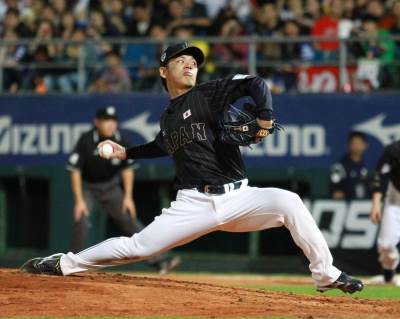 Japan and Chinese Taipei met on several occasions during national team competitions in 2013, including the second round of the World Baseball Classic in Tokyo, U12 and U18 Baseball World Cups in Taipei City and Taichung, as well as the 6th East Asian Games (EAG) in Tianjin. Chinese Taipei managed their only recent victory over Japan during the first round at the 6th EAG. Three players of “Samurai Japan”, Takerou Okajima, Motohiro Shima and Ginji Akaminai are members of the Nippon Professional Baseball club champion, the Tohoku Rakuten Golden Eagles, and will remain in Chinese Taipei to play in the upcoming 2013 Asia Series “International Tournament of Champions” in Taichung. The Asia Series, which unites the champions from NPB, Korea Baseball Organisation (KBO), Chinese Professional Baseball League (CPBL), Australian Baseball League (ABL) and for the first time the European Cup Champions, takes place from November 15 to 20 in Taichung.